July 20,2013 Mystery of the Blue Rose event in Corpus Christi, Texas. 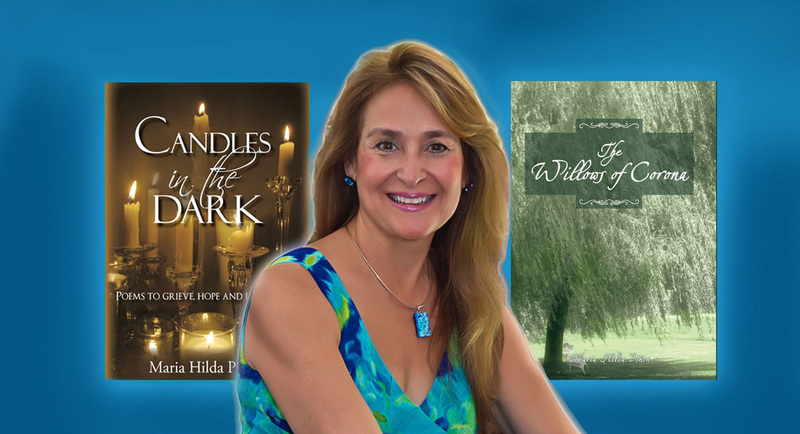 Guest speaker, Maria Hilda Pinon will offer a writer's perspective referencing her two books, The Willows of Corona and Candles in the Dark. The Event will be at Unity by the Sea-Fellowship Hall, 901 Brawner Pkwy. 8:30-3:30p.m. Music, Silent Auction, Networking games will also be available. Vendors will offer many sale items. Join the fun and enlightment!!!!!!!!! The BOOKS and BITES Fair is June 1,2013. Join Maria Hilda Pinon, at 1:30 as she does a reading from The Willows of Corona. A booksigning will follow afterwards. The fair is sponsored by the San Antonio Public Library in conjunction with councilman Ray Saldana. This is an outdoor book fair from 10:00am-4:00 pm. Authors are scheduled to read all day. Come and meet them and join the fun! of Corona on its shelf! Join author, Maria Hilda Pinon, for a three part seminar on "THE ART OF GRIEVING". seminar date are February 26, March 19 and 26, 2013 from 7-9 pm. Topics include; The Roadmap to Grief, Taking Care of Yourself, Honoring your Loved One, Prayer and Meditation. The digital copy can be downloaded for free. San Antonio Public Library invites author to speak and sign books this fall! Ramiro Salazar, executive director will introduce Maria Hilda Pinon at a reading of her novel, The Willows of Corona. The date is set for November 7, 2012 beginning at 6:30 pm with the introduction. The event will be held at the historic Landa Branch, a beautifully restored home now serving as a library is located at 233 Bushnell, 78212. Everyone is invited. Barnes and Noble and The University of Texas hosting booksigning in Brownsville, September 27, 2012 at 5:30 P.M.
PGAT hosting author to give a talk to its members on both books. This takes place October 11, 2012 at 7pm. Viva Bookstore, to host a writing workshop Saturday, October 27, 2012 from 10-12 pm. A creative way to deal with grief through poetry. Featuring: Candles in the Dark...poems to grieve, hope and love again. "Forever YOU" hosting a booksigning on October 27, 2012, 4-7 pm, located on Oconnor Rd. Call 210 637-7078 for directions. All Images and content are copyright 2011. Maria Hilda Pinon.